I reckon that one of the best things about spending time in the bush, is being able to enjoy good food out there, with amazing views and great friends. It’s just like going to the best restaurant in town, only with a view and ambience that they’ll never be able to compete with. When it comes to hiking lunches, I’ve tended to toe the food safety line and only carry processed cheese such as Laughing Cow, Babybel or Kraft (wedges or cheese sticks), thinking that as they are cheese-like products* and generally shelf stable, that they’ll be safe to eat even after a few hot days stuffed into my backpack. However, I was inspired by friends Rachel and Tom on my latest adventure to the Kimberley region of Western Australia to embrace some real cheese, in the form of a hard cheese and now I’ve tasted the truth… I’m never going back! Day 1 of 7: Rachel heading towards our first gorge of the trip. 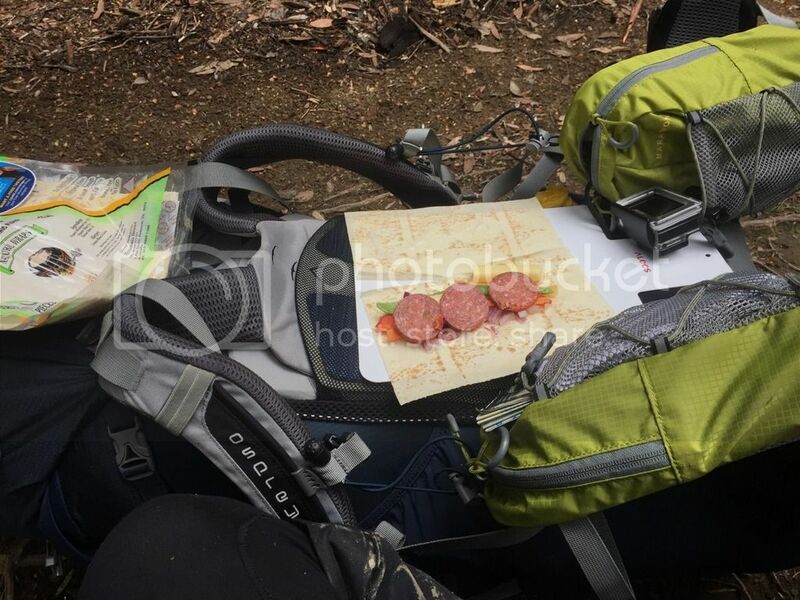 We were hiking with 7 days worth of food in our packs and with temperatures up to 43C (108F) in the hot Aussie sun, we needed to make sure that the food we were carrying would last as we were completely off-the-grid with no phone coverage or towns for hundreds of miles around. In fact, we were so remote we needed to use helicopters for transport on this adventure. It’s super hot out here in the sun! Here’s our top tips on how to pack cheese for hiking! Choose a hard cheese such as Parmesan or Grana Padano. I chose the Grana Padano and it seemed to last better in the hot temps than the Parmesan. Remove and dispose of any plastic packaging before heading out. Slightly moisten a Chux Superwipe Cloth and wring out completely. Wrap the cheese in the slightly damp cloth. Pack the cheese in the centre of your pack, surrounded by other soft items such as sleeping bag, clothes or tent. (ie. don’t have it against the sides of your pack. Each 2-3 days, rinse the cloth completely in clean drinking water and wring out completely. Each lunch, keep an eye on how fresh your cheese is and make a wise judgement as to whether you feel it is still food safe. You may also be interested in my how to make dehydrated dips and a handy field tip for eating them blog posts. Wrap your hard cheese in a slightly damp Chux (or similar) cloth. *Check your cheese labels… just how cheesy is your cheese? Is it cheese? A ‘cheese food’ or a ‘cheese product’? I love taking fresh salad in ziplock bags! Heres one I prepared earlier, this would be on day 5, it lats very well…….in Tassies climate anyway. Whoops, my pic didn’t work……..
Oh and thanks for sharing your pic – I like your table! Thanks Danny. You’ve hit the nail on the head. The key to fresh salad is the same as the cheese – choosing hard vegies with good structure – nobody wants lettuce slop :-). Snow peas are my go-to for adding to dinners, but I’ll try them for lunch too. Oh and Tassie climate? I’ve heard someone say that their parmesan was OK after 17 days out there. I bet it’s cold there at the moment!! You know it Amanda! Now all we’ve got to do is figure out how to keep a nice 2012 McLaren Shiraz in perfect nick, in the heat and transport of a pack… without all the weight. Hmmmmm. That last picture – the hill has a beautiful eye… And an eyebrow… Nose? Ha, Evie – you’re right! It took me a while but I see it too now. Lovely. Thanks for the tip Caro. I’ll def use this on a longer walk. On a 2-3 day walk I find just wrapping the cheese in baking paper works fine. Grana Padano is also my favourite: keeps well and tastes amaaaaazing! Yep… I reckon if you’re gonna eat cheese, make it one with bite! I packed Parmesan cheese on a 14 day hike through Larapinta a few years ago. as we had a couple of food drops, I vacuum sealed portions that would last 4-5 days. Had no problems at all and packed a peeler to have have gourmet ‘shaved Parmesan’ over my lunch wraps. That along with rehydrated hoummus with a few rehydrated sundried tomatoes thrown in and some foil salmon/tuna, delicious! Wrapping the cheese in a damp chux is a great idea and would be useful after taking it out of the vacuum pack. I love these blogs where we all learn something new everytime. Well done Caro!